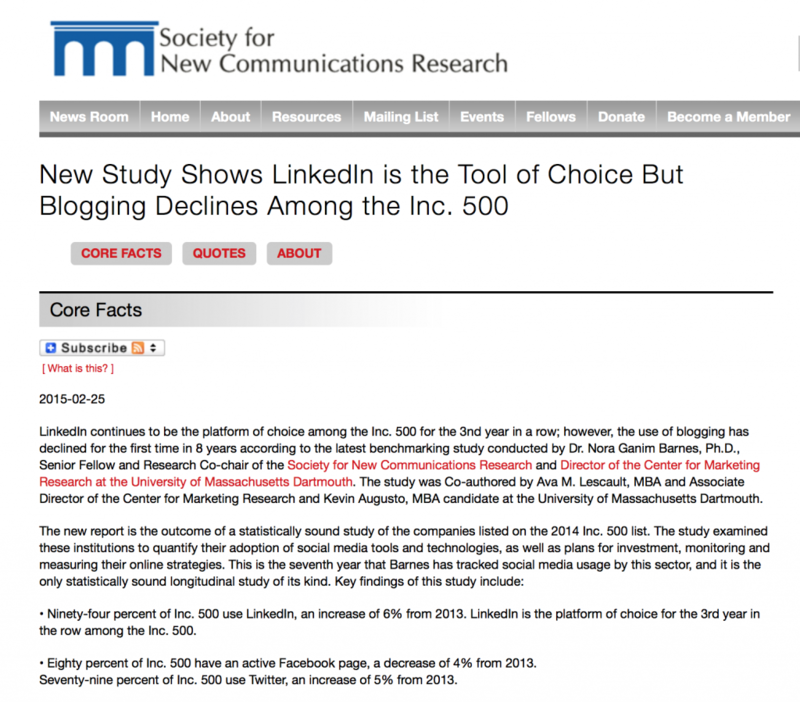 There’s a new study from the Society of New Communications Research (SNCR) this week that looks pretty interesting. No surprise about the continued success of LinkedIn – much as we question the B2B impact of Facebook and Twitter, we’ve never had any doubts about LinkedIn. But these are the first figures we’ve seen to state that blogging among the largest U.S. companies is declining. And a 6% decline is significant. Maybe it’s just too time-consuming for almost immeasurable return? Here’s the original. Well worth a closer look. How could Twitter become a platform of real B2B influence? Am currently writing a paper asking the question ‘How could Twitter become a platform of real B2B influence?’ I’m basing it on the core six hurdles for Twitter to overcome before it’s a credible source of business purchase decision advice. Maybe you think it’s there already. But can you imagine being questioned by your boss on what strategic partner to opt for, what million-dollar investment to make, what financial accounting system to choose, and saying, “Sure, let me check what’s being said about that on Twitter.” Thought not. So what would have to change? Anything to contribute to the paper? The difference between a typical PR mindset and an influencer marketing mindset. One of my roles is to chair the ‘Influencer Marketing & Influencer Relations’ LinkedIn group. It now has well over 900 members, all from the vendor side. It’s not a group for agency staff or contractors. I’ve posted before that we admit approx. 40% of those who actually apply – simply because 60% of applicants don’t meet the entry criteria we’re looking for. Over the past four months or so, I’ve been approached several times by a very senior in-house marketer with a primarily PR background. They’ve been looking to join and I’ve hesitated. I was concerned they weren’t a good fit. In early Jan I accepted them. Since then they’ve continually uploaded discussion items with links to their own posts on the Forbes management site. The posts are generic management pieces not specific to influencer marketing. It struck me this person is indicative of the gulf between a typical PR mindset and that of (what I hope is) an influencer marketing mindset. What this person is proving is that she wanted to join our LI group to broaden the distribution for her own posts – more channels equals more eyeballs seeing her work. Even if her contributions weren’t on-topic. That’s the traditional, or at least historical, PR mindset. The influencer marketing mindset is, or at least should be, quality over quantity. It’s about reaching out to perhaps far less people, but that those few are the most important ones, knowing that they’ll relay the intended message to those they themselves find most important, and so on. Rifle-shot not scatter-shot. So I wonder why someone apparently so interested in joining an influencer marketing forum would then miss the very point of it? TechCrunch today reports of an interesting Facebook initiative. Not that Facebook’s terminology is the same as ours – especially what it calls ‘influencers’ – but it’s an obvious route for them to charge their advertisers more. Another great post from Bob Apollo (@bobapollo) at Inflexion-Point. Quoting Gartner research he suggests buyers may be quite willing to help most salespeople better understand their buying process. “It seems like a self-evident truth, doesn’t it? One of the consistently effective b2b sales strategies is to sell the way your customers want to buy. All you need to do is to understand their buying decision process. According to research published last year by Hank Barnes of Gartner, your prospects may be more willing than you think to help you understand how they go about making purchase decisions. Not unexpectedly, a quarter said that they view that sort of information as confidential. Two interesting papers were published this week on the subject of ‘Understanding the Influencer Market’. Both are fairly technical breakdowns involving topics like market segmentation, product / market fit and influencer / deployment maps. Very logical and makes plenty of sense. A way better intro to the world of B2B influencers than the ‘social influence’ peddlers.